The beautiful walk in closet designs featured in this picture gallery will give you tons of ideas and inspiration. With custom designs and expert layouts a walk in closet can greatly enhance the look of your home and increase its value. From luxurious French designs to contemporary, modern and traditional designs these closets are also the perfect place to start your day. 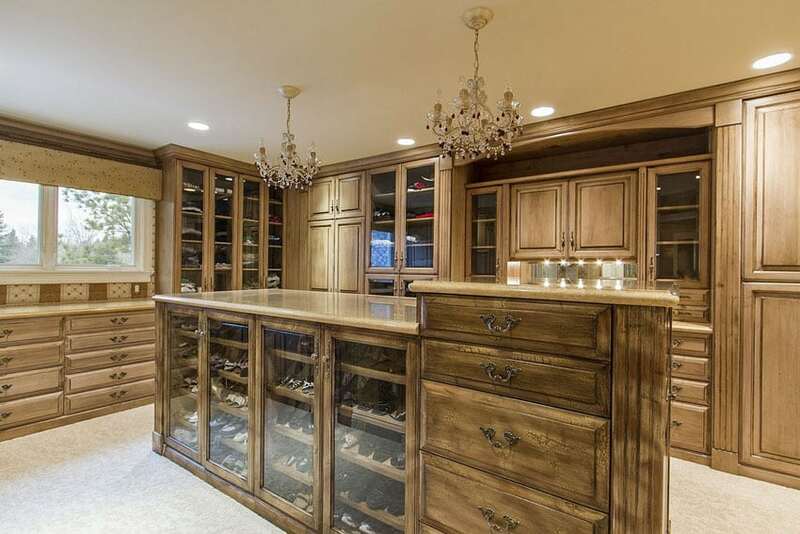 Elegance of classic French design is embodied in this walk-in closed design. It employs paneling details combined with French cabinet doors with glass. The small crystal chandelier adds more elegance and a feminine vibe into the space as well. It uses an all white color scheme, adding a touch of creams here and there for more variety. It also has mirrors to help visually expand the space, as a large French door leading outside, which also brings in much natural light to the space. For more ideas visit our gallery showcasing the types of closet doors here. 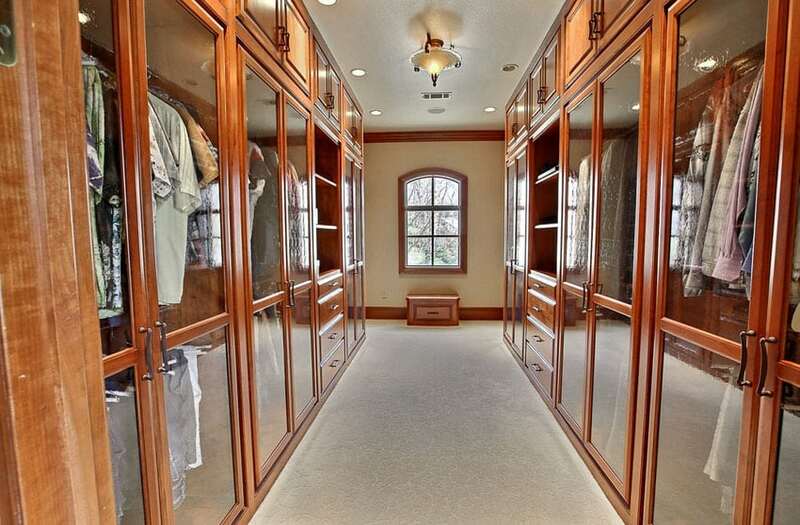 A walk in closet brings elegance and a sense of luxury to homes. It can also add value to your house. And since it is just as important as any part of the home, a walk in closet must be given adequate attention in order to get its maximum benefits. The key to designing an efficient walk in closet is functionality. Because of its frequency of use, it must provide convenience and accessibility. To achieve these along with optimal capacity, careful planning is needed. Below we share with you several guidelines in designing your very own walk in closet. Design – Aside from functionality, aesthetics is also one of the primary considerations in planning a walk in closet. The challenge of building a well-balanced walk in closet is to combine efficiency without compromising looks. This is where other factors come in, such as materials, layout, lighting, interior doors, accessories and special features – as all of these are needed to be well thought of in order to produce a stunning and cohesive walk in closet design. The complexity of the design also affects the overall cost of your walk in closet. The more design features, the more expensive it gets. Consequently this will also result to longer construction time and bigger labor costs. Materials – The materials you use for building you walk in closet plays a significant part in determining costs, the lifespan of your closet and maintenance. A typical walk in closet is composed of more than just a hanging rod and a shelf, but also includes partitions, special features and finishes. The most common and most conventional material used in building a walk in closet is wood. Wood is well loved by homeowners and designers not only because of its distinct natural beauty but because of its flexibility as well. It can be cut into different form, to assemble different storage systems while providing maximum durability and strength. It brings in luxury to a space and is proven to last for years. Solid wood cabinetry in walk in closets may be a bit expensive but its aesthetics and resilience makes up for the high cost. However, the materials that can be used are not limited to wood alone, modular cabinet suppliers usually make use of wood alternatives like MDF or medium density fiberboards. This type of material is also durable and is more suited for pre-fabricated walk in closet units that require easy installation. Another cost effective alternative to wood is melamine. Melamine is mainly composed of resin which is applied to an industrial grade particle board. ¾ inch thick thermally fused melamine particle boards is the current material choice of closet specialists nowadays. Some of its variants come in wood grained pattern that mimics the appearance of natural solid wood, but gives the benefits of resin. In addition to that, it is easy to clean and affordable. If to be used for a walk in closet system, make sure to go for thermally fused rather than cold pressed melamine as it has a better quality. Accessories – Aside from the built in cabinetry, walk in closets also make use of different accessories like hanging rods, hooks, racks, poles and organizers. One example of which is a valet pole. The valet pole is a pullout pole that is installed in closet systems to provide a place for hanging clothes. Other accessories are efficient for storing and grouping specific items – a pants rack offers a place to hang pressed pants or jeans, tie rack hanger are for storing neck ties, while a rotating watch box is used for keeping watches. Closet organizers are also an integral part of walk in closets. These walk in closet storage units have an array of compartments which allow you to sort your clothes and accessories. The common materials which are used for this are metal and wire. They can be free standing, wall hung or a combination of both – with drawer units set on the floor and shelves and hanging rods hanging from a wall panel. These are usually supported by wall studs and different mounting hardware. Coated wire is one of the least expensive options for walk in closet systems. Aside from being economical, it is also versatile and can be purchased in local home improvement stores. This type of material is easy to install, can be a DIY projects and is highly customizable. Open systems which have mesh wires provide additional visibility and adequate air circulation. Storage – Walk in closets must be composed of different compartments which are specifically designed for holding each different type of wardrobe pieces – from dresses, suits, pants, tops up to the smallest accessory like socks, scarves or ties. Storage units for this items includes shelves, cabinets, racks, hanging rods and drawers. An effective walk in closet combines all of these types together to reach optimal storage capacity. Also, it keeps thing well organized and accessible. Tall cabinets are typically used for hanging clothes while individual shelves may be used to hold folded garments. Bins may be utilized to store seasonal clothing, small garments like lingerie and hosiery may be placed in cubby and accessories like bags, belts and hats may be hung on racks or hooks. Pieces of jewelry can be stored in jewel trays with dividers to keep these small items properly sorted. Islands & Custom Features – Specialty features are added to the basic walk in closet configurations in order to enhance storage capacity and organization. These specialty features are usually custom made and may include center islands, hutches, vanity, etc. Islands are a free standing, multipurpose structure that is usually placed at the center of the walk in closet. It is usually fitted with drawers for extra storage and may serve as a place to pack as suitcase, to fold clothes or to simply fix things while inside the walk in closet. However, adequate space is the biggest requirement you have to meet in order to include one in your walk in closet design. Aside from the need for a large area, the configuration of your closet must also be considered. The drawers or doors of the island must be unobstructed in order to fully open plus a clear space of 96 inches all around the island is required to ensure a convenient flow of traffic. Hutches or hutch style dressers are versatile furniture pieces which are composed of a set of shelves and cabinets placed on top of a lower unit or counter. An example of a hutch is a vanity dresser. Aside from offering storage, it can act as a divider or a place for women to comfortably go about their daily routine of putting on makeup. Also, some luxury walk in closets incorporate a seating area which is mainly a piece of accent chair, stool or bench to aid the users and provide convenience while getting ready. Flooring – Flooring might not be a primary concern in planning walk in closets because most homeowners put a premium on storage systems more. However, this is equally important as the flooring also comprises a big part of the design. The right flooring material for a walk in closet must be comfortable to use, since most time will spent on it while standing. It must also be easy to maintain and can withstand the wear and tear of everyday use. 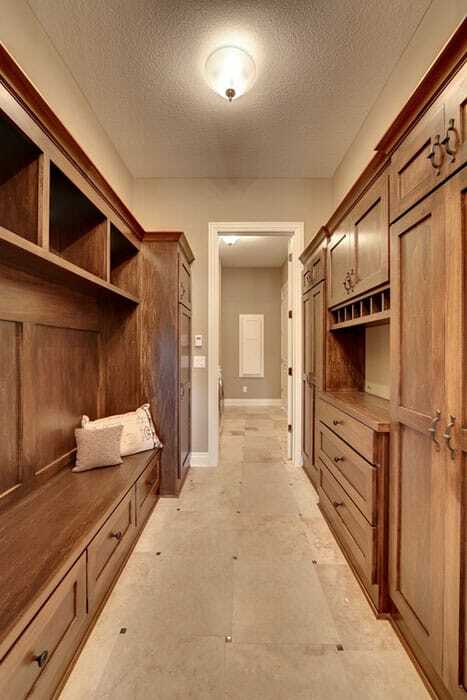 The top options for walk in closet flooring material are wood, carpet, vinyl and ceramic tiles. Aside from the practical benefits, each type of flooring also gives off a different character to the overall look of a walk in closet. Lighting – Proper and adequate lighting is also an important aspect of an effective walk in closet design. The primary goal is to be able to see everything clearly, even those which are situated at the back most part of your walk in closet. Most homeowner go for LED lights as they are energy efficient, bright and long lasting. Also, motion sensor lights or closet light which switch on and off automatically when the closet opens or closes also provide a lot of convenience. There are also lighting fixtures which are directly built into the hanging rods. Just remember that when incorporating artificial lighting in the layout of your walk in closet, this must be situated between you and the contents of the storage so you can get a clear illuminated view without being over casted with a shadow. For an elegant look many walk in closet designs feature a beautiful chandelier or pendant light fixture. Chandeliers are available in mini sizes for smaller closets to give your space the glamorous and sophisticated look you want. Traditional style chandeliers often use a flame shaped bulb that offer a candle light for a vintage aesthetic. A variety of different modern bulbs are available including LED, incandescent and fluorescent depending on your lighting needs. Natural lighting is also important, however windows are uncommon in walk in closet because they take up wall space. Also, direct sunlight can sometimes damage clothes and cause them to fade. Window treatments like shades or UV protection may be used to address this problem. The color of lighting is also significant as it greatly affects how you see color. For example, under warm white ambient lights, a pure white piece of clothing can look a bit yellowish. You must be able to clearly distinguish what a navy blue slack and a black pantsuit is. Of course, you wouldn’t want to wear mismatched clothes just because the lighting in your closet makes you see things differently. Hire a Pro or DIY? Since walk in closets require a large amount of built in systems, it entails a lot of work to construct one. While some may consider carpentry to be a bit easy, it is still best left to professionals, especially if you are working with solid wood materials. Leaving the planning, designing, lay outing and building to the hands of a professional carpenter or contractor will not only ensure a well thought of walk in closet but it will also guarantee its lifespan. As proper installation is also key to a long lasting walk in closet. You can also hire a professional closet consultant if it suits your needs. Designate zones – Dividing your walk in closet in specific zones will not only help you plan storage efficiently but it can also aid in organizing its contents. These zones are divided according to the frequency of use of the items. For this part, remember the 80-20 rule. They say that most people only wear 20% of their wardrobe, 80% of the time. Since these items are frequently worn, make sure to put them at an accessible height. Everyday clothes must always be within reach. Personal items like makeup, purses, wallets, bags and everyday makeup must be placed at a comfortable waist height. Since these items are also frequently used, they have to be effortlessly seen once you enter your walk in closet. Also putting them at a waist level makes them easy to grab and stow again. Seasonal apparel like coats, fleece, sweaters, thermal wear and winter attires may be placed on top most shelves and may be stored in bins. Occasional pieces like formal wear, suits and cocktail dresses may be placed in the corners so they don’t get in the way of the more frequently used items. The same rule applies to footwear. Shoes which are frequently used must also be kept accessible. Occasional shoes may be kept on top shelves so that they do not get in the way of the everyday items. Zones may also be designated according to “his” and “hers” sides so that personal items are grouped more accordingly. Following the same order of storage, but then each side of the walk in closet corresponds to his and her areas. Order of storage systems – Applying these zones, you can now devise an effective storage system for your walk in closet. It is easier to navigate and everything is more accessible. Simply put, the basic configuration of a walk in closet is unused items on top, most frequently used items in the middle, and other regular items at the bottom. Translated to storage systems, that can be open shelves on top, hanging rods and drawers in the middle and shoe racks at the bottom. • Use as much as space as possible. Walk in closet space is premium so maximize every inch of it including depths, widths, heights and corners. Incorporate cabinetry whenever you can but do not forget to create balance. • Utilize vertical space. Include extra shelving units or utilize the back of cabinet doors for hanging organizers. • Take advantage of corners. Put a neglected space into use by setting up a carousel at the corner of a walk in closet space. • Use adjustable rods. Not only do adjustable rods provide accessibility but they can also be easily set up at different height according to your needs. Also adjustable rods double up space. • Accessorize. Small accessories like hooks are the ultimate space saver. These are very useful for hanging hand bags, robes, ties without taking up floor space. Pull out rods are also efficient and accessible too. •Incorporate a mirror in the design. Mirrors create an illusion, making spaces appear bigger. Also, a mirror is a basic essential when dressing up. • For those with limited spaces, hang more garments. Clothes take up less space when they are up compared to being folded and stored on shelves and drawers. • Add life to your walk in closet by introducing color. Add a splash of colors through accent pieces and other furnishings to make it less stiff and boring. Avoid concentrating on a single type of storage system for the entirety of your walk in closet. For example, hanging rods which run around the whole perimeter of the walk in closet do not encourage the best use of space. A full wall that is set with floor to ceiling shelving units are not effective either. Remember, the key to a well-planned walk in closet is the combination of different storage types. Use a mixture of flat, angled, open and hanging shelves and cabinets systems. With regards to hanging rods, never install a hanging rod too close to a shelf. Maintain a 1 ½ inch clearance from the base of the shelf to the hanging rod, or else it is impossible to hang anything up. Also, make sure that the hanging rods are in no way obstructing with the doorway. If placed too close to a door, they have the tendency to interfere with the entryway especially if too many clothes are hang in them. This large walk-in closet has lots of natural light combing in from the full-height French doors and windows, making it look really bright and fresh. It uses open-type cabinets and shelves, making the clothes easily accessible, and uses white, to help make the colors of your clothes stand out. At the center of the room is an island counter with additional drawer storage for things like house clothes, underwear, accessories and more. There is a bit of science involved in designing walk in closets. It is more than just putting storage pieces together to produce a beautiful design. More than the aesthetic aspect of planning a walk in closets, optimum functionality and full accessibility must also be achieved in the design. In order to produce a walk in closet layout that is efficient, standard dimensions must be followed. These standard dimensions and minimum measurements were devised by designers in order to produce a walk in closet that is ergonomically sound and anthropometrically correct. Space Requirements – The minimum area for a walk in closet is at least 7×10 feet or at least 10 square foot for two users. The standard dimensions for a walk in closet include a width of 5 to 12 feet, with a typical average of 6 ½ feet wide. The overall depth of the room is usually 5 to 17 feet. This minimum area maintains a 3 foot wide hallway to allow adequate clearance for traffic and to provide efficiency in going about daily routine. Compared to a standard reach in closet, a walk in is considered to be another room in the house, rather than a piece of built in furniture. It may be a few feet in size, to a half or full room, often situated with a master’s bedroom. A walk in closet offers more space than a traditional one, providing vast storage opportunities. For additional space to accommodate a chair within the layout, an additional 3 square foot will suffice. However, if planning to put a center island in your closet, more space is required. These standard dimensions and minimum area requirements gives enough space to build full storages on two to three walls of the room, while providing enough elbow space for convenience. Standard Dimensions – Here are some of the standard measurements for designing effective storage systems in the walk in closet. *Anything between 1700 to 2200 has very limited access, meaning it is beyond the average useful reaching capacity of most people. Combining the classic elegance of old world style design and the light and fresh feel of modern aesthetics, this massive walk-in closet successfully provides storage, organization and elegance. Instead of the usual all-white cabinets, it uses solid walnut with matte varnish finish, combining it with glass panels for the cabinet doors to give it a more modern feel. It also uses mirrors to help make the space look bigger, and modern cabinet lights to help you see the contents of each cabinet easily. The closet’s two chandeliers supported over the center island give this space a dramatic appeal. 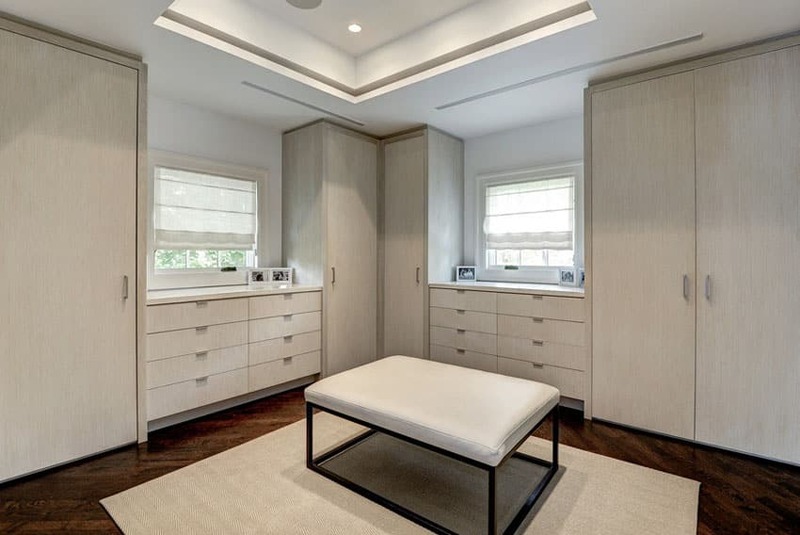 Space was definitely maximized in this walk-in closet design as it successfully uses all available wall space to its maximum, by installing floor to ceiling height cabinets. On the left side of the image, are cabinets with glass panel doors, making you see through the shelves inside for storage. On the opposite side, are panel cabinet doors as well, but this one uses mirrors instead, making the somewhat limited space look bigger. This walk-in closes uses a red-on red combination. Redwood floor boards were combined with redwood cabinets and shelves, creating a bright and bold looking closet. The built-in open closet is made up of a variety of open adjustable storage shelves, drawers and clothes rack. It also has a small ottoman in the middle of the room which is especially useful when fitting shoes and gives the room a more feminine decor touch. Using solid walnut floors and white cabinets, this walk-in closet exudes classic elegance and modern sleekness. The wall space is maximized with cabinet and shelf storage, kept away from dust through doors with glass panels, which helps you determine what cabinet to open. In the middle of the closet is a square island counter with more drawer storage and a marble top in which the perfumes and other items are displayed. Inspired by classic French interiors, this walk-in closes borrows some details and silhouettes to give it that classic French vibe. The floors are elegant solid marble, paired with all-white cabinets with carving details. One side of the close is the wardrobe which was fitted with sliding doors with mesh screen to mimic a trellis. On the opposite side, is a combination of wardrobe cabinet and shoe shelves, and in the middle, is an oblong counter, with drawer and cabinet storage and a marble top in which the perfumes were placed and displayed. 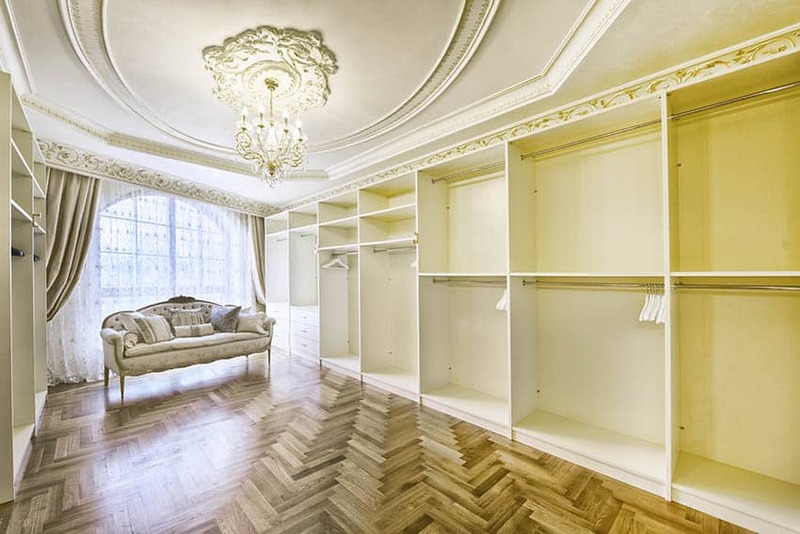 An elegant neo-classic closet which combines white cabinetry with dark wengue wood floors and gold accents, creating a very timelessly elegant look. The open type cabinets appeal clean and organized, as the clothes and shoes were carefully sorted and color-coordinated. The French windows helps brighten the space and make it easy to see everything inside. There’s also a full-length mirror, an island table with drawers and a golden chandelier to further add details to the space. Keeping it clean and organized, this walk-in closet opted for a closed-type cabinets, using solid mahogany door frames with glass panels to make it easy to know which cabinet to open. The inaccessible top storage was used as a closed cabinet for rarely used items, effectively using space. There’s also a few open shelves and drawers for items which need to be easily accessed. 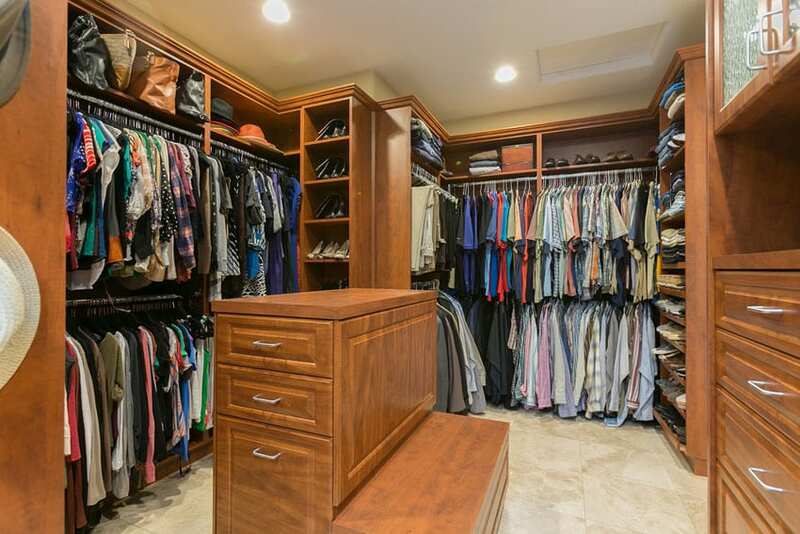 A massive walk-in closet with lots of open storage, showcasing the array of clothes and other items in the room. This much clothing could be overwhelming with all the different colors and textures, and to help tone it down, the cabinets and the rest of the room are all white. There’s a combination of hanging racks and open shelves, creating a good variety of storage for all your needs. It also has a large island counter in the middle which also has more drawer & cabinet storage. With a rich wood design and leather armchair this luxury walk-in closet gives off a distinctive masculine vibe. The large size offers an opportunity for a his and her closet layout with chest of drawers and plenty of rack space. A shoe storage closet at the end of the room is a nice feature that is highly sought after. To keep the place looking clean & organized, all storage is closed, creating a very clean and uniform look. Instead of the usual all white cabinets, this one uses light maple laminates for the cabinets and has a large rectangular ottoman in the center of the closet. This modern walk in closet has an excellent combination of colors and closed & open storage. The space is fairly large further enhanced by one full-height mirror wall, giving you lots of room for storage. Clothes are mostly displayed on open hanging racks and shelves, while more intimate items and other accessories are kept in the drawers. It has a large island counter with plain white solid surface top and sides, and has light beech wood laminates for its drawers. The rest of the closet uses the same laminates, creating fresh & modern look to the space. 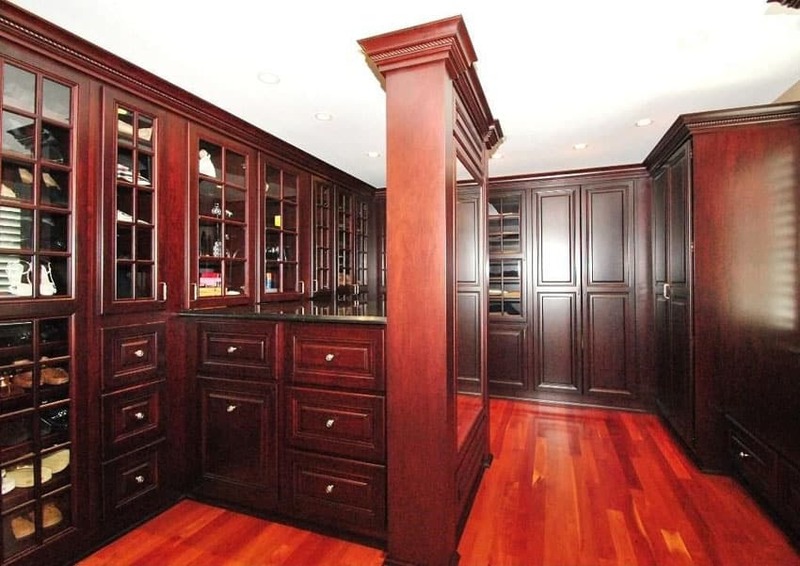 This closet goes for a more elegant, masculine, and classy look, using solid Mahogany paneled cabinets. To give it a modern twist, the clothes cabinets uses glass doors framed with Mahogany, making its contents visible, yet keeping it away from dust. The closet also includes lots of drawer space, and even a small storage bench in the middle aisle. 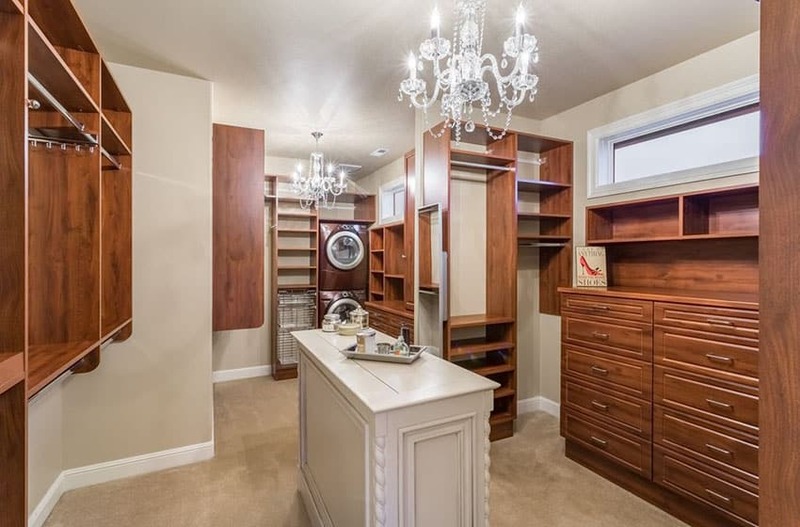 This closet has a unique curved wall, automatically giving this closet a very unique and modern layout. The open clothes racks with overhead cabinet space follows the curve of the wall, providing a massive roomful of hanging rods. Shelves are kept open & easily adjustable as well, making it easy to modify and access the items you need. The beauty of this walk in closed is with its wonderful combination of contrasting finishes, creating a bold yet elegant looking walk-in closet design. Maple wood cabinets were combined with dark wengue cornices and black marble, which makes a stark yet elegantly subtle contrast. The glass faced bedroom wardrobe makes clothing selection a breeze and keep dust and debris off of your clothing. 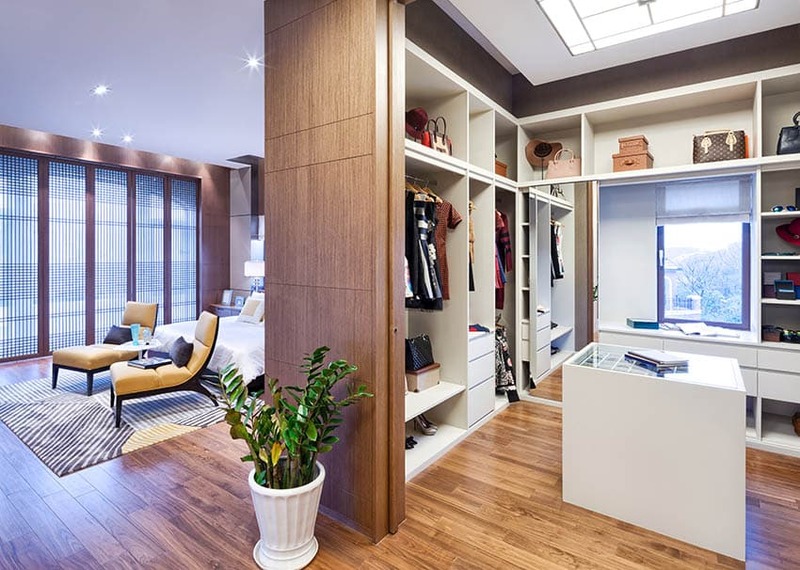 A contemporary walk-in closet design,m which uses the typical all white color scheme to make way for the different colors of clothes and shoes inside the space. Storage is mostly open, with a few drawers for more intimate items. The upholstered bench in the middle makes it easy to fit various shoes for your outfit, and also helps soften up the look of the space. This is another contemporary walk-in closet design, which uses steel blue painted cabinets, creating somber yet relaxed look. Maple wood adds warmth to the otherwise cook toned steel blue cabinets, complementing each other well, creating a balanced look. Most of the cabinets are open type as well, with a few drawers for smaller items. This classic style walk-in closet has lots of natural red tones, creating a dark and bold design. The floors are bright cherry wood, adding a vibrant pop of color to the area, while the cabinets are solid redwood, stained and varnished to achieve a more traditional style of cabinets. The cabinets are all closed storage, with a few French door cabinets with glass panels. This modern walk-in closet has quit a limited space and an irregular layout which makes designing the cabinets a challenge. Due to the limited space, this design opted for an open-type storage, with open shelves and hanging racks, making the items easy to access, with a few drawers for other items. It uses elegant golden walnut wood for the cabinets, adding warmth and subtle elegance to the space. Beautiful walk in closet designs should make you smile every time you enter the room. Using solid Mahogany all though-out the closet, the whole space has a nice warm orange tinge, giving it that classic look, despite using modern adjustable shelves and hanging rods. You will see that one wall is dedicated for the shoe storage, and the irregularly shaped wall is for the clothes and drawer storage. 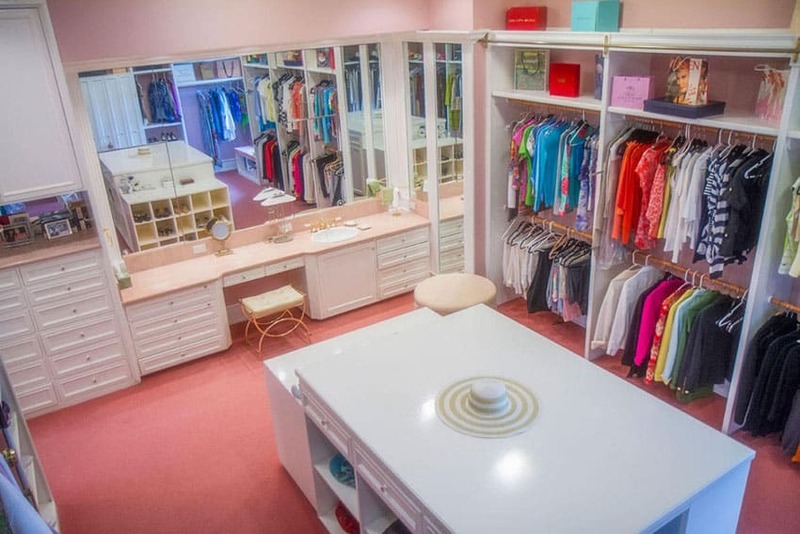 A very gorgeous attic walk-in closet, going for a bright and feminine look by using light colors. Walls and the sloped ceiling were all painted white, and the floors is engineered wood in a very light beech wood color, adding a subtle touch of warm color in the space. For the cabinets, white is the color of choice as well, whit closed cabinet doors fixed with glass panels. Due to the limited ceiling height because of the ceiling slope, some cabinets were made to fit the available space, creating a low clothing storage, an some low shoe shelves. This narrow walk-in closet goes for a more rustic look. Solid teak wood were used to create the cabinets, which was then stained in a weathered walnut finish. The finish of the cabinets, combined with the rustic taupe flooring and oatmeal walls, create a warm and rustic vibe to the space, while keeping it looking elegant. A unique feature of this closet would be its long built-in bench which were fitted wit storage underneath. With a neo-classic inspired styling, this walk-in closet exudes elegance and modern simplicity, demonstrating efficient use of space through excellent layout planning. The cabinets are all painted in white to make the space look clean and bright. It has a combination of open and closed storage – there are shelves with glass panel doors, open rack of clothes, as well as closed cabinets with mirrored doors to help extend the space. It also has an island counter in the middle with drawers for additional storage. This small walk-in closet demonstrate efficient use of space. It has a combination of open and closed storage, using dark Mahogany wood with frosted glass panels. This enables you to display items used more often, and choose to keep more expensive clothing items on closed storage. It also has an island counter with cabinets and shoe shelf space. 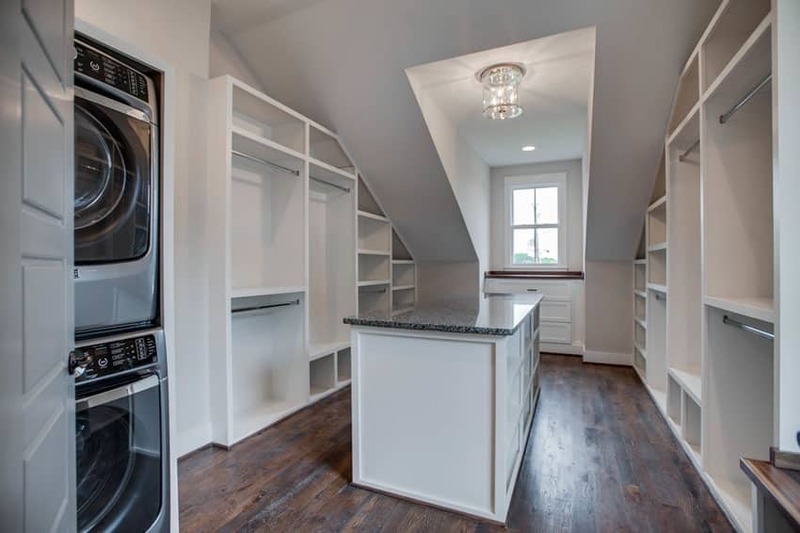 This attic walk in closet space combines the laundry area with the closet. The sloped ceiling of the space makes it quite challenging to design, but the custom-made cabinetry was able to efficiently use all available wall space for storage. 2 Sides of the wall were filled with open storage shelves and hanging racks, using white for a clean minimalist feel, which is a nice contrast against he old oak wood flooring. Beautiful walk in closet designs like this are every shoe-lover’s dream come true. It takes advantage of high-tech motion hardware, enabling you to efficiently maximize space. There are two rows/layers of shoe shelves, the smaller of which has top and bottom sliding runners, which you can use to move it side by side to access other shoes. The rest of the closet also has modern styling, with open hanging racks painted in plain white. Combination of pink walls and coral carpet floors adds a soft blushed look and feminine wive in this large walk-in closet. 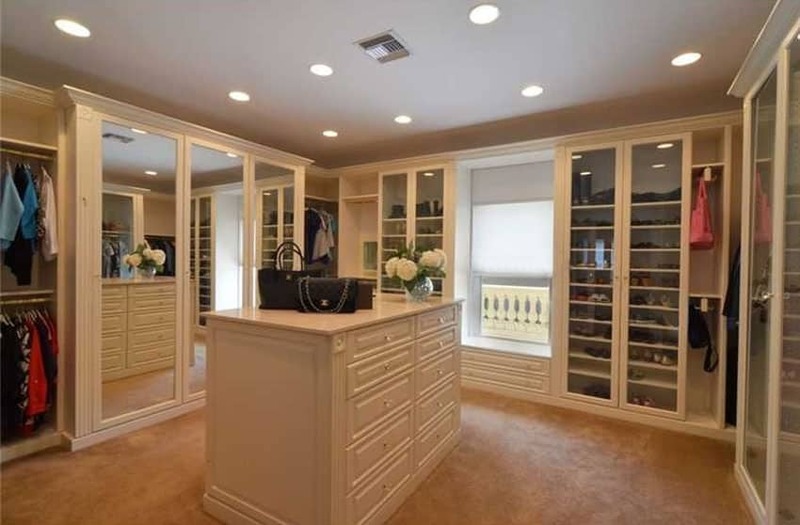 The open storage spaces are all in white laminates, which really matches the pink walls One wall has a large built-in vanity with lots of drawer storage and a massive mirror with white wood frame. The room also has a large island counter with more drawers and open shelves, adding more storage space. The beauty of natural wood is emphasized in this small walk-in closet. The color scheme is a nice mocha color for walls and dark walnut wood tiles for the floors. For the cabinets, a modular system was used, in a natural clear-stained walnut, creating a nice mate finish. The cabinets are all open-type, with a few drawers for special items. This is a large minimalist modern walk-in closet design. Due to efficient layout/planning, the room has a large open floor area which has enough space to fit in a few movable furniture pieces. All wall were fixed with floor to ceiling height modular cabinets and open shelves laminated in white, which comes out nicely against the dark brown porcelain tiles and the beige walls. Inspired by classic cabinet designs, this walk-in closet uses paneled cabinets painted in an off-white color, to give it a slightly aged look. The cabinet doors in this closet has clear glass panels, enabling you to see inside. It also has lighting inside the cabinet, which helps you see its contents even when there is no more sunlight leaking through the window. Aside from closed cabinet storage, it also has open clothes racks, as well as drawer storage for other items. For more related ideas visit our gallery of walk in closet ideas.